Vinyl is a unique product that is rich in features – suitable for virtually all residential and commercial segments – from luxury hotel rooms to residential basements. Vinyl flooring has been growing in popularity at double digit rates for the past few years, during which time it has become a game changer in the flooring world. Let’s take a look at the different market niches wherein vinyl flooring is making an impact in a big way. For a long time, hardwood flooring has been the preferred choice among homeowners looking to replace their flooring. Now, things have changed. A homeowner may come in looking for hardwood flooring – only to leave with vinyl flooring. This is because vinyl has more aesthetic appeal compared to hardwood. Vinyl is said to be more family friendly than hardwood and laminate, and it also is more stylish than other types of floorings. Vinyl can be applied practically in every room in a house and it is cost effective especially when installed in large rooms. Compared to laminate, vinyl makes no tapping sounds when walked over. When it comes to property management projects, it is obvious that vinyl is a favourite material because it provides longer service lifespan than carpet. Vinyl flooring has been widely accepted in apartment communities because there are no acoustical issues to be concerned with. Vinyl flooring is gaining more acceptance and is expected to gain more interest due to its waterproof qualities, especially in the wake of the current weather changes leading to recent flooding. In the recent past, vinyl has taken over the construction of new houses and renovations, compared to its counterparts; the carpet and VCT. In the last five years alone, there has been tremendous growth in the product. 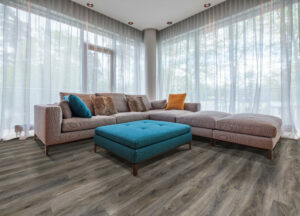 Vinyl, also referred to as LVT, has gotten better as far development is concerned and this is projected to continue. Thanks to the innovation of the vinyl plank, vinyl has become a constant feature in property management projects and will continue to grow in coming years. Expert contractors have noted that the ease of maintenance is a huge factor for customers looking to replace their flooring, and vinyl is a popular choice since it can be easily pulled up and replaced. Another reason for the success of the vinyl plank is that it is easy to clean. Vinyl cannot be scratched easily and is moisture resistant, and requires less maintenance compared to wood. These qualities have enabled vinyl to steer its way successfully towards many commercial establishments. In the past, in the hospitality industry, hotels will strictly specify carpets for guest rooms. But now, vinyl is being paired with area rugs in hotels and this type of flooring is even being used in the bathrooms of modern commercial properties. The time spent and costs on a project, are major factors when choosing flooring products. When it comes to installing vinyl flooring, businesses prefer the smaller cost, fast turnaround and less labour-intensive features. Businesses don’t have to shut down during renovations since replacing vinyl flooring does not accommodate lengthy installations or acclimations. Contactors are also turning to vinyl since it offers designers a world of exotic wood species from its variety of patterns. Vinyl has the capability of giving realistic looks of wood and stone which most builders look for when installing flooring for rooms, entryways and bath areas. This unique look raises the value of a home, and the cost of maintenance and repair is less when compared to ceramic tile and hardwood floors. Builders agree that vinyl offers more than even real wood, because the material is more durable. It has the capability to hold up incredibly well to wear and tear, and when installed correctly, vinyl is impervious. Vinyl flooring has been a dream come true for most homeowners who are parents, or own pets, or anyone who appreciates high-durability flooring – and that’s why builders are wooing their customers with vinyl. For main street businesses to grow, whether professional offices, small retail shops, cafes or restaurants, they need to spend wisely on construction costs yet portray the best business brand image. This means they need to invest in durable and beautiful flooring that is low maintenance. Flooring dealers are seizing this channel opportunity to make vinyl more acceptable for main street businesses. The tile visuals and wood look that vinyl offers, gives designers limitless decorating possibilities to allow business owners to customize their work premise floors to match the rest of the décor. Most main street businesses operate in stringent spaces which need a flooring material that is durable. Since business floors have a high level of traffic, they need to be replaced after some time. A business owner has to calculate how much it will cost him to replace flooring every now and then and choose the right type of flooring. Vinyl is easy to replace or repair, which makes it a great choice for main street businesses.